User's story 9: Water treatment system | IBE TECHNO CO.,LTD. It was 10 years ago that "Sakado Azuma Kindergarten" installed large sized π-water filter machine. "Tap water contains chlorine. Chlorine destroys vitamins you take in. We want to give children good things for their healthy growth. So we decided to change the water which is indispensable for keeping health. Therefore we chose π-water," the director of the kindergarten Etsuko Suzuki explains. Then they looked for good water for the children and finally they came to know π-water. You can get π-water from every tap in the kindergarten so many parents bring the water back to their home every day. We are paying the very careful attention to the quality of the treated water. We check the water five times per year to keep the quality. We are glad to hear that some graduated children from our kindergarten say that the water here tastes really good. They know it when they compare the water available in their elementary schools. 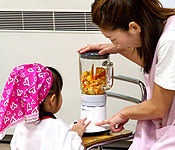 The Sakado Azuma Kindergarten is focusing on "education of eating". Children sow a field with vegetable seed, harvest in each season, and eat the crops by their own cooking. Through their eating the crops they raise, they know the nature, think of the farmers, and feel the linkage of human being and environment. To know the water, which is the origin of the all lives, is a part of the education. They are proud of supplying the safe and good water for the children in the kindergarten. The kindergarten has two Japanese bantams. 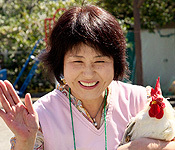 Etsuko Suzuki, the director is mostly taken to by them. Children will learn the importance of foods. It was 37 years ago Sakado Azuma Kindergarten opened. The philosophy is "Cultivate the independence and the consideration for others." They wish the children to take care of themselves and to think of the others. They have visited LINX, a resort facility which installed π-water system for the whole institution, many times before their introduction of π-water filtering system. The lavatory is always kept clean and no bad smells at all. ※The contents of this story are based upon interviews.